As a behaviourist and dog trainer I often deal with other professionals within this arena. One such behaviourist, who has become a good friend over the years alerted me to this little chaps plight. At the time this puppy was around seven weeks old and had already showed himself to have a fighting character having survived when many of his littermates had died. Sonic had been hand reared and made it! Well at least until seven weeks old. 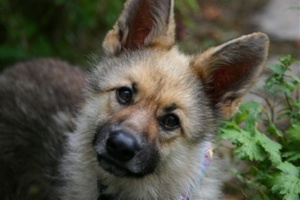 At this time it had become clear that Sonic was not a ‘normal’ German Shepherd Dog and questions began to be voiced that he may well indeed be a ‘pituitary dwarf’ This is a genetic disorder that restricts growth and causes many many problems for those that suffer from it. It seems because of these concerns he was taken to the vets to be put to sleep but then moved to my colleague for assessment and rescue if at all possible. Pituitary Dwarfism.....This raised many concerns. Should this pup be put to sleep to avoid the suffering he may have to endure? Should he be allowed to live, at least for a short while whilst he was healthy and enjoying life? If so who would take on such a puppy? The obvious costs that would accompany him throughout his life (however long that may be) alongside the fact that you would be asking someone to take on a puppy that is going to cause immense heartbreak if or when he gets ill or his life comes to an end makes it impossible to determine the rights or wrongs of either decision. Trying to make a decision when the little fellow is bounding around your feet and looking at you with those big eyes is, in my experience, totally impossible. It kind of mashes your brain somewhat! Researching Pituitary Dwarfism didn’t really help matters either! Whilst the medical facts are there to find there is relatively little advice to be found from people that actually have hands on experience. After days of considering all of this, and knowing that deep down I am a real sucker for all dogs the decision was made, Sonic (as I named him....he did kind of resemble a hedge hog!) arrived on the morning of Wednesday the 20th August. Now, whilst this is dangerously sounding like the cloud has a silver lining and all will live happily ever after kind of story we still have to consider the future. To start with I guess we need to show you what’s been happening between the day he arrived and now, after all at the time of writing this Sonic is fast approaching a year old! When he arrived at seven weeks he weighed in at 1.5kg, not much more than a bag of sugar! Each week he is weighed and measured to chart his progress. He reached 5.3 kilo’s at 20 weeks old! Over the weeks he did start to lose hair and become lethargic, after blood tests to check his health thoroughly it has been confirmed he is a pituitary dwarf, his growth hormone test proving this. A puppy his age should have produced results above 500 on the scale, Sonic was 49. Sonic is now 13 months old, at this stage we thought he would have considerable hair loss and possibly sore skin. The hair loss is due to him being hypothyroid, a common condition in dwarfs. This can be treated and he is now on medication for this. Careful consideration has also been applied to his dietary needs in order to try to keep him in the best condition we can. At one stage his bloods also pointed towards him having Addison’s disease, we all had a dreadful few days waiting for results on further blood tests to prove or disprove this; he did in fact get the all clear. He does however require monthly blood tests to ensure his medication is correct. 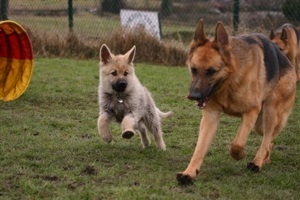 Other than this he has settled well and is having an extremely happy time with our four other dogs. He joins in our puppy and clicker classes, accompanies us to the office and is generally having a fabulous time! Veterinary advice and nutritional advice has been sought a big thank you to Shearbridge Veterinary Practice and all their staff and also all the folk that have thus far provided nutritional advice. Our aim, is that Sonic will have a happy, fulfilled life and be allowed to be a dog, his strength of character that has allowed him to survive this far tells us there is really no need to ‘wrap him up in cotton wool’ He is allowed to play with the other dogs and enjoy life to the full. I will continue to update his story and continue to raise support for his veterinary costs to make his life a happy one. Veterinary costs have so far totalled nearly £3000, the ongoing blood tests, medication for his thyroid issue including dietary supplements continually put a drain on our resources, many thanks also goes to the folks that have worked hard to raise funds for him and the many folks that have donated. I also hope that in future times Sonic’s story will be one where other people that are unfortunate to find themselves owning a pituarity dwarf will be of great help to them the help I could not find. Further help is however needed to raise funds, please contact us via the contacts link on the home page.